Bulté, I., & Onghena, P. (2008). An R package for single-case randomization tests. Behavior Research Methods, 40, 467-478. Ferron, J., & Ware, W. (1994). Using randomization tests with responsive single-case designs. Behaviour Research And Therapy, 32, 787-791. 山田剛史 (1999). 単一事例実験データの分析方法としてのランダマイゼーション検定 行動分析学研究, 13, 44-58. Stewart, K. K., Carr, J. E., Brandt, C. W., & McHenry, M. M. (2007). An evaluation of the conservative dual-criterion method for teaching university students to visually inspect AB-design graphs. Journal of Applied Behavior Analysis, 40(4), 713-718. 山田剛史（2000） 単一事例実験データへの統計的検定の適用 : ランダマイゼーション検定とC統計 行動分析学研究,14(2), 87-98. 望月 要・佐藤方哉（2003） 行動分析学における"パーソナリティ"研究　行動分析学研究, 17(1), 42-54. Hayes, S. C., Barnes-Holmes, D., & Roche, B. (2001). Relational frame theory: A post-Skinnerian account of human language and cognition. New York, NY US: Kluwer Academic/Plenum Publishers. The purpose of this training institute is to increase the national capacity of education researchers to conduct methodologically rigorous single-case intervention studies. Evidence-Based Communication Assessment and Intervention, 2008, 2(3)：　Meta-analysis of single-subject experimental designs: Why now? Kratochwill, T. R., Hitchcock, J. H., Horner, R. H., Levin, J. R., Odom, S. L., Rindskopf, D. M., & Shadish, W. R. (2013). 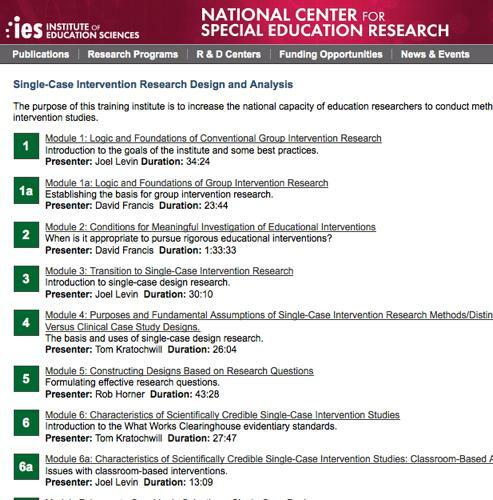 Single-case intervention research design standards. Remedial And Special Education, 34(1), 26-38. Parker, R. I., Vannest, K. J., & Davis, J. L. (2011). Effect size in single-case research: A review of nine nonoverlap techniques. Behavior Modification, 35(4), 303-322. Smith, J. D. (2012). Single-case experimental designs: A systematic review of published research and current standards. Psychological Methods, 17(4), 510-550. Parker, R. I., Vannest, K. J., Davis, J. L., & Sauber, S. B. (2011). Combining nonoverlap and trend for single-case research: Tau-U. Behavior Therapy, 42(2), 284-299. Kratochwill, T. R., Hitchcock, J., Horner, R. H., Levin, J. R., Odom, S. L., Rindskopf, D. M. & Shadish, W. R. (2010). Single-case designs technical documentation. Retrieved from What Works Clearinghouse website: http://ies.ed.gov/ncee/wwc/pdf/wwc_scd.pdf.